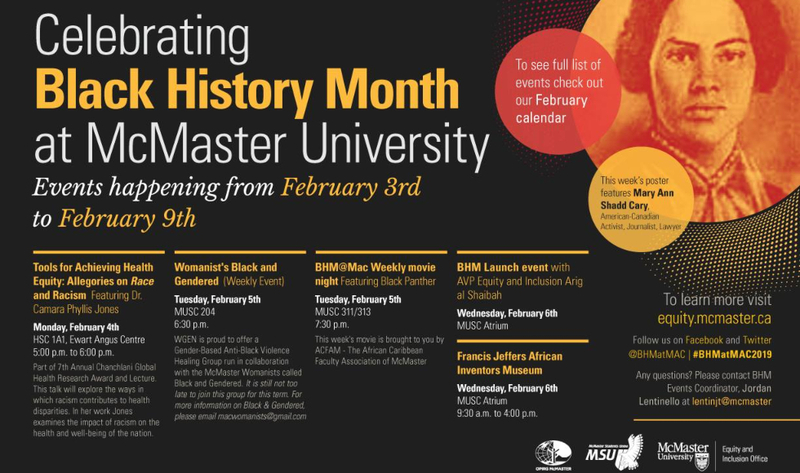 Mac will celebrate Black History Month throughout February with discussions, displays and educational and cultural events. The celebrations officially launch on Wednesday, January 6 in the MUSC atrium with a display from the African Inventors Museum. The museum, a travelling display with both artifacts and information from and about Black inventors, will be on view from 9:30 a.m. until 4 p.m.
Tools for Achieving Health Equity: Allegories on Race and Racism (Monday, February 4, HSC 1A1, Ewart Angus Centre) 5 p.m. to 6 p.m.
Part of the 7th annual Chanchlani Global Health Research Award and Lecture, this talk by Dr. Camara Phyllis Jones will explore the ways in which racism contributes to health disparities. A gender-based anti-Black violence healing group that offers drop-in discussions on Mondays from 7 p.m. to 8:30 p.m. in MUSC204. (For information, contact macwomanists@gmail.com). BHM@Mac weekly movie night (Tuesday, February 5, MUSC 311/313) 7:30 p.m.
Other events throughout the month include weekly movie nights (February 15 and 25), a discussion on Black Lives Matter with Tolulope Ojo (February 14) and “Let’s Talk About Race – a discussion with Malinda Smith and McMaster’s AVP, Equity and Inclusion, Arig al Shaibah” (February 26). Specific locations and times will be posted weekly on Twitter (@BHMatMAC) and Facebook (@BHMatMAC). For more information, contact Jordan Lentinello at lentinjt@mcmaster.ca. Mac will celebrate Black History Month throughout February with discussions, displays and educational and cultural events. The celebrations officially launch on Wednesday, January 6 in the MUSC atrium with a display from the African Inventors Museum. The museum, a travelling display with both artifacts and information from and about Black inventors, will be on view from 9:30 a.m. until 4 p.m. Events for the week of February 3 to February 9 include: <ul> <li><strong>Tools for Achieving Health Equity: Allegories on Race and Racism</strong> (Monday, February 4, HSC 1A1, Ewart Angus Centre) 5 p.m. to 6 p.m. <ul> <li>Part of the 7<sup>th</sup> annual Chanchlani Global Health Research Award and Lecture, this talk by Dr. Camara Phyllis Jones will explore the ways in which racism contributes to health disparities.</li> </ul> </li> <li><strong>McMaster Womanists, MSU Women and Gender Equity Network presents Black and Gendered</strong> <ul> <li>A gender-based anti-Black violence healing group that offers drop-in discussions on Mondays from 7 p.m. to 8:30 p.m. in MUSC204. (For information, contact macwomanists@gmail.com).</li> </ul> </li> <li><strong>BHM@Mac weekly movie night </strong>(Tuesday, February 5, MUSC 311/313) 7:30 p.m. <ul> <li>This week: Black Panther, brought to you by the African Caribbean Faculty Association of McMaster</li> </ul> </li> </ul> Other events throughout the month include weekly movie nights (February 15 and 25), a discussion on Black Lives Matter with Tolulope Ojo (February 14) and “Let’s Talk About Race – a discussion with Malinda Smith and McMaster’s AVP, Equity and Inclusion, Arig al Shaibah” (February 26). Specific locations and times will be posted weekly on Twitter (@BHMatMAC) and Facebook (@BHMatMAC). For more information, contact Jordan Lentinello at lentinjt@mcmaster.ca.